On the Job Training means we never experience solutions until we roll with troubled equipment. 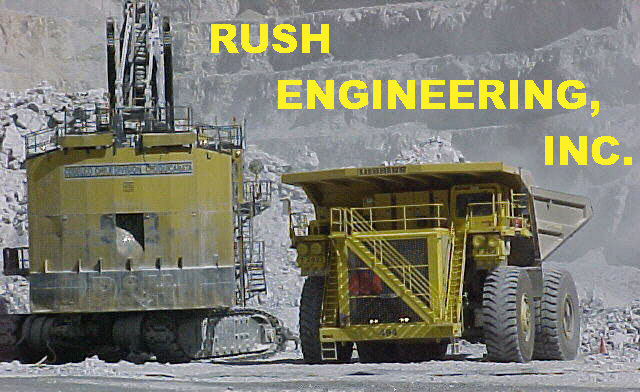 Rush Engineering, Inc. applies state of the art techniques to resolve first time problems. Every job is a unique learning experience where proven procedures result in solutions. After 25 years the most expeditious solutions to new problems are our trademark. [Hit F11 to maximize screen. This movie of a kite surfer was photographed while on a ground vibration monitoring project. The lesson learned is profound, for it occurred on July 13, 2005 while America was caught in a wave in Iraq. The kite surfer tells all entrepreneurs that getting knocked down by the winds of economic and political cycles is not the end of the game. The true Americans are those who can be dragged through the economic surf and get back out on the ocean of enterprise to sail without losing the freedom to fall and to rise with the treachery of the fickle winds and waves of fortune. This movie presents the background stars through which the wind surfer sailed. This Cosmic OJT shows the purpose of all residential construction business, which is the Cosmic Command, "Build a nest. They will come." The surfer crosses the Salt Creek estuary and the River Eridanus and is turned back at the Eye of the Storm, Cetus. Turning himself around he is stopped at the banks of the cosmic river and Salt Creek while the kite rides the snot nosed Donkey, Lepus, and he loses the fickle northeast wind and is knocked down near the End of the River, Achernar and the Phoenix. Keeping faith in the true northeast wind and holding his donkey's footing firm to the sail board, the wind sailing kite reaches for the asterism of the Dove, Columba, who places nesting materials on the kite and the surfer is pulled out of the rolling foam at the estuary of Salt Creek and the coffin at the River Styx, Fornax, as if to say, "This is my son in whom I am well pleased." From the tomb of the rolling foam the kite pulls the surfer onto the ship of true dreams, Argo Navis, and it sails tranquil waters off the estuary shore. when sailing on summer dreams. If we build the nest, true dreams will come! Harry Nilson, Everybody is talking at me. [Click on movie bar arrow once or twice to start movie.